Wedding speeches are an integral part of any wedding and can be deeply moving, emotional and at the same time, a source of great hilarity but getting them right is as much about the timing as it is about the content. 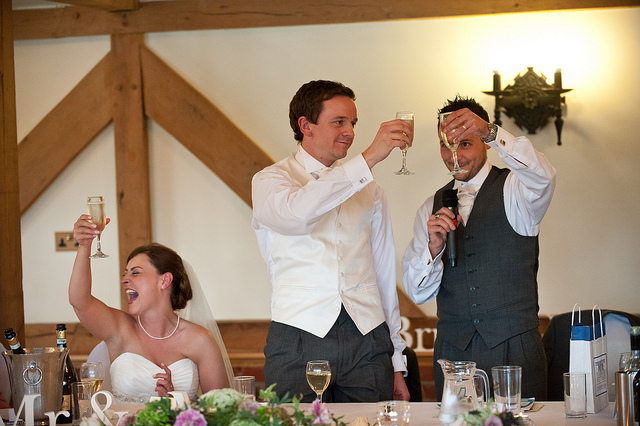 The last time you were at a wedding where speeches took place at the beginning of the meal were the best-man’s jokes met with deep, rumbling belly laughs or a polite titter? When the groom thanked the bridesmaids for a sterling job, was this followed by a round of roof-raising applause or a gentle patter. And, when guests were asked to stand for the third and final time did you detect a faint sigh of relief that whispered around the room as everyone got to their feet? If the answer is yes, the explanation is simple… the guests were hungry! If the speeches overrun by more than a few minutes the soufflé you chose for your entrée will fall even flatter. Guests feeling the need to nip out to the car where, having learnt from previous experience, they’ve stashed a round of emergency sandwiches. Consequently they miss half the speeches. However, if you truly have your heart set upon speeches before dinner, there are a couple of things you can do to ensure your guests don’t get too fidgety waiting for the food. Firstly, ask the venue to provide bread rolls on the tables so your guests have something to chew on and secondly, impress upon those making a speech the importance of sticking to the timings you have agreed with the venue so that when your food does eventually arrive it hasn’t dried out from sitting in a hot cupboard for twenty minutes or more!